All together I read 66 books, not including school books and other read-alouds with the kids. Some of those were slow-and-careful reads, some were quickie reads. Most I would say weren't a waste of time although some were disappointing…but that's mostly because I'm not afraid to quit reading a book that does feel like a waste of time and those don't get counted. J There were probably another 5-8 books that I started and read a significant amount of before I quit. I learned a lot about myself as a reader this year – what kind of books are really worth my time, what kind of books I should probably pass on because I will probably be disappointed, beginning to feel less intimidated by the Great Books - which is helping me hone my selections to make the best use of my reading time. I do love to read, but there are always more books than time to read them - I want to make the most of that time. I also started keeping a Commonplace book mid-year…may I suggest this practice to you as well? Taking time to jot down thoughts and quotes in a journal forces me to think and ponder more deeply rather than just read and move on. So here you have it…the books of 2014! The Lord of the Rings trilogy. I had tried a couple of times to read this when I was younger, and this time I finally connected with it. I can't wait to revisit these with my kids in a few years. Or shall I say "best non-fiction I haven't mentioned under another heading" J I'm going to say Rachel Carson's Sense of Wonder – short, easy read but very inspiring. Highly suggested if you need some fresh motivation to get out and do some nature study. I'm going to say Carolyn Weber's Surprised by Oxford, although Essex Cholmondely's The Story of Charlotte Mason is right up there at the top too. I am going to say Homer – I've read both The Iliad and The Odyssey this year and I'm glad I did. I look forward to revisiting these at some point in the future. Book that made me cry was the heading in the original post that I took this idea from, but quite honestly…I don't tend to cry over books. But perhaps 'sentimental favorites' fit with the theme? Besides these are books I love that I read this year that I love and so they need to make my list somehow, right? Right. Anyhow…favorite books I revisited this year were Jane Austen's Pride and Prejudice and Persuasion and Jan Karon's Mitford series. I think I'm going to say Isobel Kuhn's In the Arena. The stories and testimonies she shared in this book helped me to view my present season and some of the issues that I am struggling with in it as training ground for what the Lord may have for me in the future. That perspective has been the difference between continuing on in the face of discouragement and quitting. Probably Edmund Jorgenson's Speculation – this book was interesting but rather strange, and I certainly didn't anticipate where it was going when I started. Probably The Deadliest Monster. We read this in the AO book group as a follow-up to Frankenstein and Dr Jekyll and Mr Hyde, as the premise was that it would build on those into a discussion of worldviews. I found the book oversimplified (maybe I was expecting too much since it is really a book for young people? ), his presentation of the Christian worldview narrower than it needed to be (presenting one specific set of theological preferences, which bothered me even though I mostly agreed with his theological preferences), and I didn't really care for the us-and-them tone in it. It was an interesting concept, but I didn't care for how it was carried out, and will likely choose a different book to explore this topic with my kids when we get to those upper levels of AO where it is scheduled (Year 10, I think). Desiring the Kingdom. I had heard so many good things about this book, and in the end found the book itself disappointing. He did have some good and thought-provoking things to say which I have continued to mull over, but those nuggets were mixed in with a fair amount I didn't agree with or appreciate. The book also could have been about a third of the size and still made its point, perhaps even making a stronger case for it by being more direct and less rambling. I'm not sorry I read it, though. Mary Shelley's Frankenstein, especially paired with The Strange Case of Dr Jekyll and Mr Hyde and Dante's Inferno which I also read this fall (well I haven't finished The Inferno yet, but I started it this fall). These three have really made me contemplate my sinful nature, the tragic consequences of sin, and thereby increased my gratefulness for God's grace. You know, I do almost all my reading on Kindle, so I don't know that I can really pick one for this category. 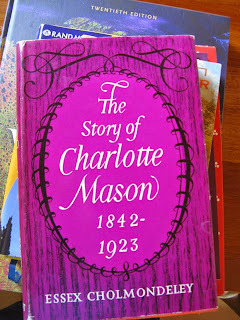 I ended up with a lovely old copy of The Story of Charlotte Mason, however, which makes me happy to look at. I really enjoyed reading a couple of Genevieve Foster's history books – George Washington's World, The World of Captain John Smith, The World of Columbus and Sons - there are several others as well. I really like the way she traces major people and events taking place all over the world against the backdrop of one single influential person. These are written for an upper-elementary and middle school readers, and a couple of them are scheduled in AO Years 4-6. I also really liked George MacDonald's The Princess and the Goblin, which I pre-read as it is one of Michelle's Year 3 literature selections that I will assign to her to read on her own. Homer and Lord of the Rings. Did I read any books on Homemaking this year? I don't read much in this genre anymore – I have systems that work for me so it's not a reading priority. I did re-read bits of The Hidden Art of Homemaking this year which is possibly my favorite. I didn't actually read For the Children's Sake this year, but know I've recommended it several times – it's my go-to recommendation for those wanting an introduction to Charlotte Mason. I've also recommended Surprised by Oxford to several people too. Besides the Bible, right? J I'm going to say Glimpses of Grace by Gloria Furman. I enjoyed reading this. You probably don't know me, but I read your blog and have seen you on the AO forum. :) Anyhoo.. I'm in the middle (have been trying to get it done ALL DAY!) of my end-of-year-books post and I, too, feel the same way about reading things that are worth it. I still will read a "fluffy" book every now and then for a little break, but in general, I'm trying to be more intentional about my reading choices. My time is precious these days! I think I might use these categories, too. If you don't mind. :) Fun! There are a lot of great ideas on your list. I saw a lot around the web about Desiring the Kingdom earlier this year and after reading your thoughts, I'm glad I never picked it up. :) I have to also agree with you on the book cover--how can it *not* make you smile? Happy New Year to you! God bless! Thanks for stopping by Catie. :) I recognized your photo from the forum. I'll have to click over and read your book list now. :) Happy New Year to you too!